Here is this week’s prompt, kindly provided by Vanessa Rodriguez. René took his tearful wife into his arms, knowing she was right, but wanting so much to ease her distress. 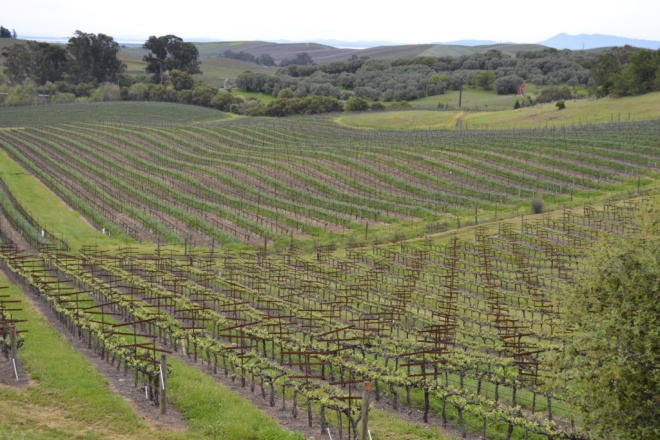 The vineyard had been their hope for the future… for themselves, their children, and grandchildren yet to be born. Now they faced a future of hardship and regret. 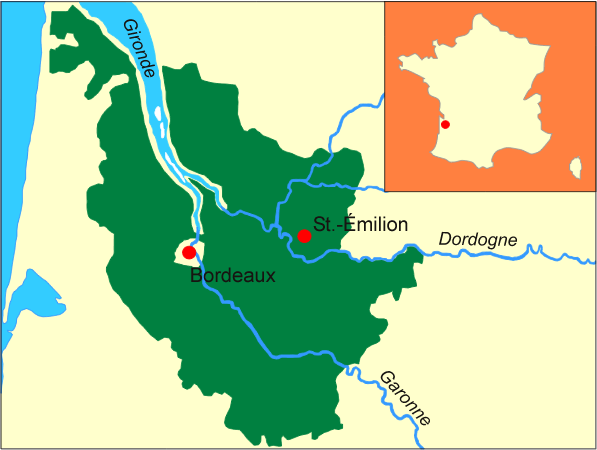 My story this week is based on the phylloxera outbreak in France in 1887 (often called the ‘Great French Wine Blight’). I’ve written a little about it at the end of my ‘exta’ piece below. The earliest evidence of a fermented drink based on grapes is in China, 7,700 – 6,600 years BC. It gradually became more widespread and we soon find evidence of it in the Near East. The grapevine and the alcoholic drink produced from it were important in Mesopotamia and Egypt and were essential aspects of Phoenician, Greek and Roman civilisations. 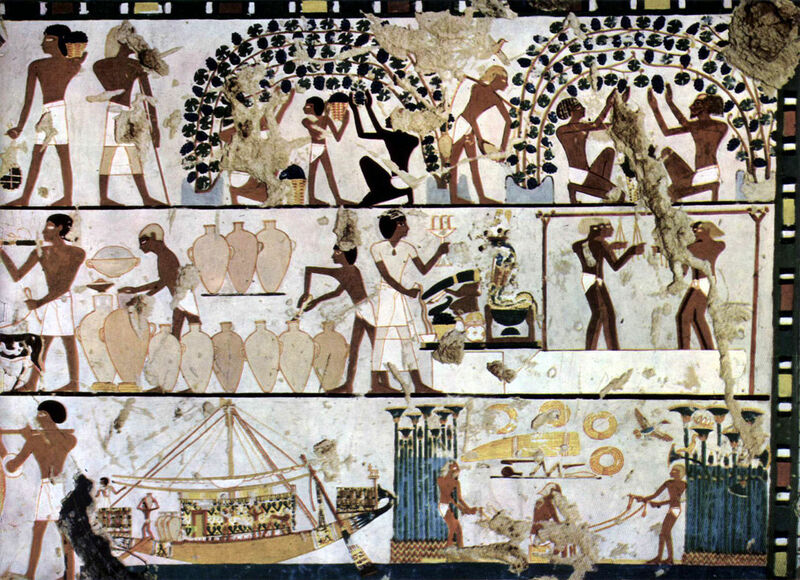 Grape cultivation and wine making in ancient Egypt. Author: Agyptischer Maler in the 1500s. Public Domain. Wine was an integral part of the Roman diet and wine making became a widely spread and precise business during the time of the Roman Empire. Most of the major wine producing regions of Western Europe today were established during that time. 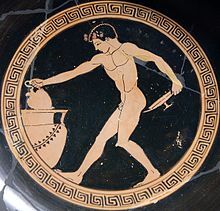 Wine-making technology improved during Roman times, as did the number of varieties of grapes and cultivation techniques. The design of the wine press advanced and barrels were developed for the storage and shipping of the wine. The most famous Roman wine was Falernian, due to it high alcohol content! Anyone who has read the brilliant Falco books by Lindsey Davis (set in ancient Rome) will recognise this wine as one of Falco’s favourites. Wines were also mixed with herbs and minerals for medicinal purposes. 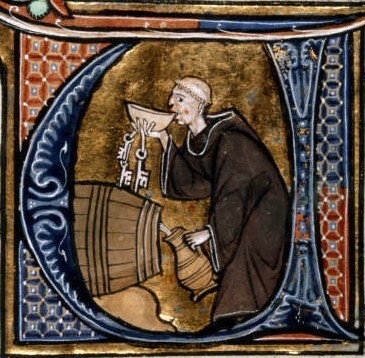 Throughout history, wine has often been associated with religion. The Greeks worshipped Dionysus (god of wine) and the Romans carried on his cult, calling him Bacchus. Wine has been in Jewish culture since Biblical times and has been part of the Eucharist commemorating Christ’s Last Supper in the Christian Church. Although Islam generally forbids the production and consumption of alcohol, during the Golden Age (8th-13th century) alchemists such as Geber pioneered wine distillation for medicinal and industrial processes (e.g. producing perfume). In the medieval period, wine was the common drink of all classes in the south of Europe where grapes were cultivated. Further north and east, where few grapes were grown, beer and ale were the usual beverages. Wine was exported to these regions but was expensive, so was only consumed by the upper classes. Because it was used in the Catholic mass, a supply was crucial. Benedictine monks became one of the largest producers in France and Germany, followed closely by Cistercians and various other Orders. Wine production increased dramatically from the 15th century onwards as part of European expansion. 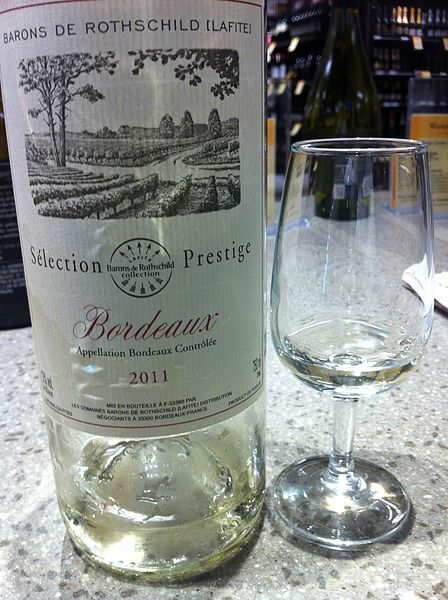 By the 18th century, the wine trade had soared, especially in France, where Bordeaux became the preeminent production. In the New World (America) the first successful wine production was in Ohio in the 19th century. In Australia, too, wine production began about that time. In the Old World at this time, Champagne was established as a favourite luxury drink and fortified wines like sherry and port became increasingly popular in Britain. 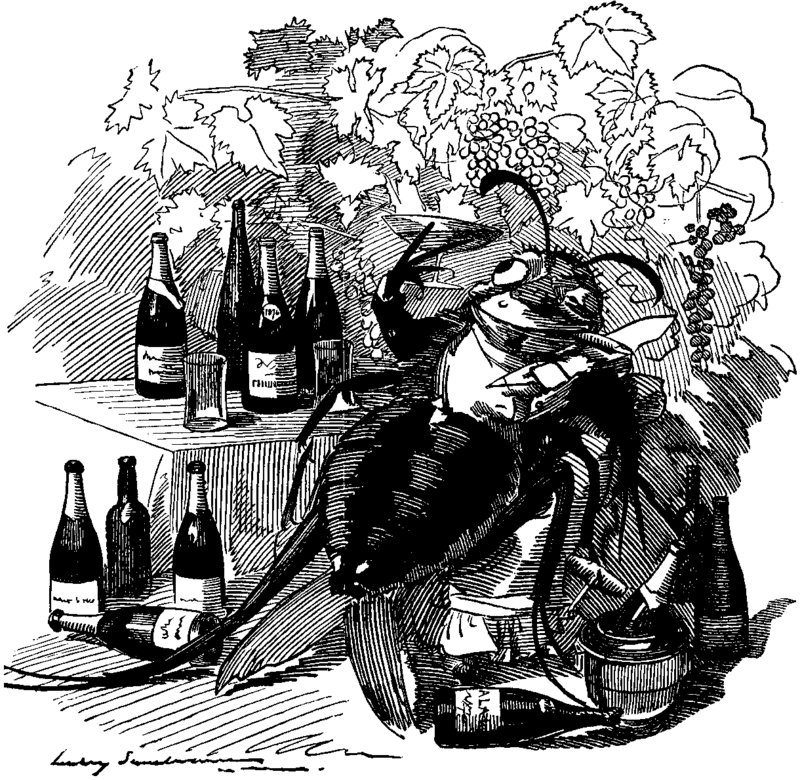 Vineyards everywhere were badly hit in 1887 by a disease called phylloxera (often grape phylloxera) which was caused by the infestation of almost microscopic, pale-yellow, sap-sucking insects related to ahpids. 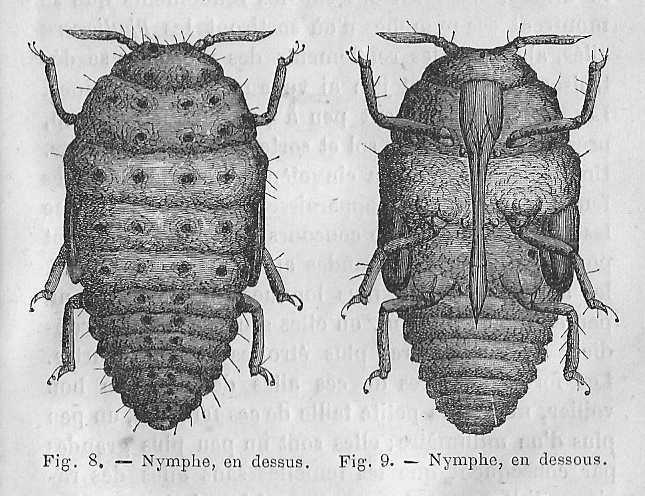 Phylloxera nymphs. Author: Maurice Girad. Public Domain. It is possible that it originated in North America and was carried across the Atlantic in the 1850s (although this is still debated). France was the worst country to be hit but other European countries were also affected. It was dealt with by grafting European vines to the resistant American rootstock that was not susceptible to phylloxera. It proved effective, but the ‘Reconstitution’ of the French vineyards – as it was called – was a very slow process. There are still a few vineyards in Europe that inexplicably remained unscathed and exist today as they did before the disease arrived. Thanks, Huma. Phylloxera would have ended a lot of people’s dreams. Great story Millie! It was an excellent example of pessimism vs. optimism. The information you gave was VERY interesting. I didn’t know about that bug that did so much damage. It would be interesting to find out why some vineyards were not effected by it. I enjoyed your story and the history of wine production ,and the photos. Love the bit of history in your writing it makes it feel very real. Thanks also for the wine information. Thanks, Scrapydo. It was a very difficult time for wine-growers when phylloxera got a hold. Credit to René for his optimism, but I reckon Françoise’s prediction is closer to the truth… Excellent use of the prompt! I think René’s optimism is just for the sake of his wife. But you’re right, Sonya, it took a long time to clear the vineyards of this pesky bug. A scary and uncertain future ahead for these poor people. Thanks, Ali. Definitely an uncertain future for the industry in general. I imagine that many small, family concerns would have been unable to cope and went out of business. It took a long time to get rid of these ‘bugs’. Sad story and interesting information. It’s easy to forget in our ‘pick up whatever you want at the supermarket’ world that crop production and other plants used to be, and still can be, so vulnerable to nature. What a very astute comment, Bekki, and so true. We do take so much for granted nowadays and want everything ‘on a plate’, so to speak. So many things in nature are susceptible to disease – not to mention climate change and land degradation and so on. Thank you for sharing that thought – much appreciated. Oh dear. Is it Ash Dieback disease? I heard something in the news about that being around. It’s such a shame and, as you say, you can’t stop it carrying on dog’s paws. It’s not long since we had Dutch Elm disease, either. No. You’re right Ash Dieback is about, but this was some parasite beginning with P. I know, if you’d seen it, you’d have taken proper notice. I’ve seen nothing about a parasite around here, but I’ll keep my eyes and ears open now. The effects must be pretty bad for such precautions to be necessary. The notice says they’re felling threes to stop it – so must be pretty bad. I’ll go back and read the notice properly. I was in a bit of a hurry, so may have got it all wrong, although they definitely didn’t say Ash Dieback – it was a weird name us dyslexics need time to work out! I’d look it up if I had a few more letters. P is a bit limiting. 😀 I wonder if it’s a localised thing , or more widespread in the UK. I want to know more now… Perhaps it will be on your local news, if not the national. Ears open, I think. Thank, Bekki. LOL! Think there was a T too. I’ll let you know when I know. I must say, I was in a tearing hurry, but it did cross my mind I’d heard nothing of it before. Was it Phytophthora? My husband has just suggested that as a possibility. When you’ve had a look, would you mind letting me know? Very interesting, anyway. Yes, I think it might well be. Will let you know. I love this. The last line fills us with suspense and a whole new world around the corner. In a sense we don’t want them to beg, but at the same time the new adventure excites us. A marvellous flash fiction, Millie. Fantastic 🙂 I love how inspired you are by many subjects and how you put them into your creative writing. It’s inspiring. You’re welcome. Thank you for your inspiration 🙂 Enjoy your writing. “‘Another hurdle, Françoise, not the end” What a great way to view misfortunes! Well done! Excellent tale Millie and I liked your link with history…I see you do love to research don’t you….thanks for sharing so much…. Thanks Michael. Yes, I really enjoy looking things up. I knew about phylloxera and just needed a few extra details about the history of the wine industry in general. Like René I’m an optimist (more of a cynical optimist, if that’s possible) and would have told Françoise the same thing (while brushing up on Massenet’s “Meditation” from Thaïs to be played on les Champs-Élysées for pecuniary tokens). Surely, Massenet’s ‘Meditation’ from Thais can only truly be appreciated on les Champs-Élysées! It’s good to hear you’re an optimist. Why be otherwise? There’s always the hope of receiving those ‘pecuniary tokens’, should luck run out. Thank you for that nicely optimistic comment Prospero. great story Millie – and love the mini history of wine at the end 🙂 ahh those crazy Romans. if only they didn’t all go mad in the end from all the lead (and god know what else) they kept adding to their wine! And on another note, in Australia they always grow roses alongside every row of vines in vineyards because the rose plant is more susceptible to phylloxera – so if the rose gets sick, then they know the vines might be next.. Thanks, Az. Yes, lead pipes didn’t do the Romans a lot of good at all.lol Totally contaminated water… I didn’t know about the rose trees, so thank you for that…it’s very interesting. I imagine they rely on pestidides nowadays, once the phylloxera aphids are about, but whether that’s a good thing or not is debatable. Do you live in Australia, Az, or just know about the use of rose trees from reading and so on? I live in Sydney, but I’m also an unashamed wine lover 🙂 We’re lucky enough to have the Hunter Valley vineyards less than 2 hours drive away, and tend to make an annual trip up to there (used to be more often once upon a time!) they mainly grow Shiraz and Semillon there, but the larger wineries sell varietals from other regions as well. Well worth the visit if you’re ever in this part of the world! We had a month in Australia ten years ago, and stayed along the Gold Coast. We spent most of our time having trips out, Including flying out to the Barrier Reef (I adore snorkelling). We had one visit to a vineyard and that was great. It was too early in the day to drink much, but we had a few samples of excellent wines. We had some wonderful ones with evening meals, too. I rarely drink alcohol now (I need to focus when I write!) but my husband still buys various Australian wines. It’s a big, beautiful world, and I wish I could spend all my days travelling. Perhaps I’ll win the lottery…! Well, some women are wise, so I have to give them credit for that. So many books set in the past depict women as total airheads! lol As it was, the phylloxera outbreak did take a long time to deal with, and many smaller vineyards would not have survived. We’ve had some lovely days but today’s been typical for here – some sun, some rain. We never know what to expect, it’s always so changeable. Thank you for liking both my posts. I’m almost through the alphabet now with my WOW posts. Goodness knows what I’ll do for X, but I’m sure I’ll think of something. Malta sounds so nice 🙂 Talk to you later!